Around 17,000 Mw of hydropower projects with a cumulative cost of Rs 1,63,000 crore have applied to the NHPC to either take them over or form joint operational ventures. Of these, at least three projects totalling over 5,500 Mw capacity belong to Jindal Power. A person close to the development said the Naveen Jindal-promoted company offered the projects last month. "We are exploring prudent avenues of association to unlock shareholder value and build hydroelectric energy assets for the nation," a Jindal Power spokesperson. 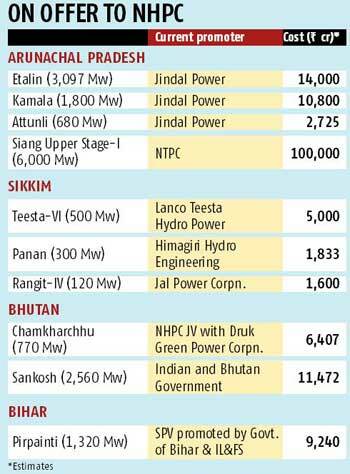 The majority of projects being offered to the NHPC were awarded between 2008 and 2010 in Arunachal Pradesh and Sikkim. Besides Jindal Power, IL&FS, Lanco and the state governments of Bihar and Arunachal Pradesh had approached the NHPC to join hands with them, said government officials. The NHPC had said it would not take over any project but "could contemplate taking over operations on chargeable basis, that too in some cases," said a senior official requesting anonymity. The official said there was also a likelihood of the NHPC adopting a consultancy role. The Jindal Power spokesperson said the Etalin, Kamala and Attunli projects were in various stages of development. "The company had signed agreements for development of the three hydroelectric projects with a combined capacity of 6,100 MW in Arunachal Pradesh in joint venture with Hydro Power Development Corporation of Arunachal Pradesh," the company spokesperson added. Officials said state governments and private players won projects awarded in tariff-based auctions in an initial market exuberance. "After years of delay and regulatory hurdles, when the cost has doubled or tripled, they want the government company to step in," said a senior government official requesting anonymity. 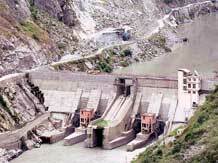 The government opened the hydropower sector for private participation in 2003. Arunachal Pradesh offered close to 60,000 MW of projects to the private sector but the majority of them did not commence construction. Planned to come up in remote areas, these projects faced regulatory hurdles, strikes by the local population and protests by environment protection groups, said a senior official. Constant delays have led to cost overruns and the final power tariff increasing. Most of the projects are presumed to be unviable. "In 2006-07, power was traded at Rs 7-10 a unit but in the last three years traded power is Rs 2.50-3. The private sector sees it as attractive no longer," explained the official. The tariff in most of these projects is Rs 5 and above.